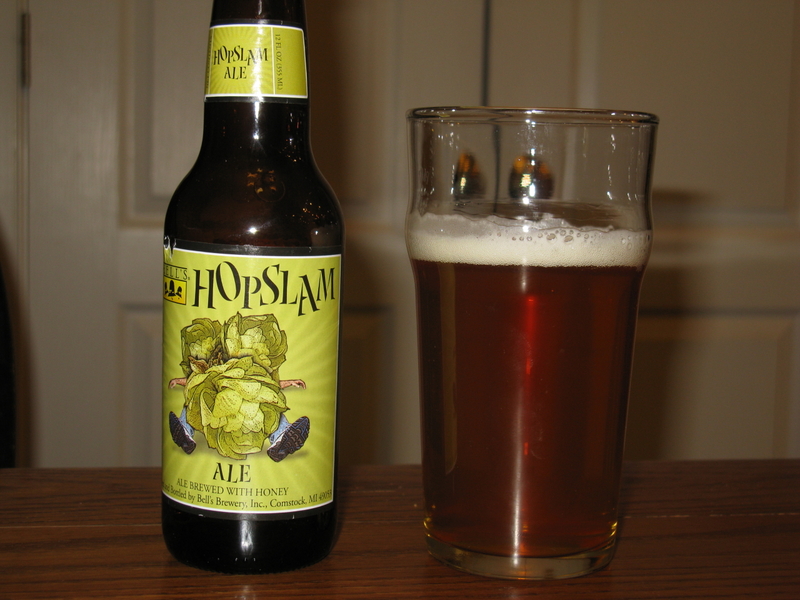 I had a chance to get my hands on some Hopslam, a double IPA from the folks at Bell’s brewing out of Michigan. Weighing it at 10% alcohol with an OG of 1.087, it is quite a potent brew. It also has to be pretty dang well attenuated, as 10% ABV is going to have a final gravity around 1.010. It comes in a 12 oz bottle, as most of their products do. Unfortunately, the picture is a little dark, but the color is a nice amber with orange hues. One thing I noticed pouring this out was that there was no yeast in the bottle, a first for me with Bell’s. Everyone of their products I have had before had yeast in the bottle, but I suspect this guy maybe harder to carbonate with bottle conditioning, and it was force carbonated. Anyway, the first thing you notice when you smell the beer is this incredible aroma. Mango, Pineapple, Grapefruit all come jumping out at you and hits you over the head. It smells pretty damn good. The body was lighter then I was expecting given the ABV, solidly in a decent pale ale range, but not thick and syrupy. Honey is added to the beer, and being almost entirely fermentable, it lightens the body while kicking up the alcohol. The taste is spicy up front, with some fruity esters. It tastes like a Bell’s. I grew up drinking their products, and they have a fairly distinct taste, which I think is from their yeast. A lot of homebrewers culture this up, because they have come to enjoy the taste, and before this bottle, every one I have ever had has the yeast sitting on the bottom. The finish is almost resinous with hops, bitter, sharp, and quite refreshing. You can feel the oils coating your tongue. According to their website, this is dryhopped exclusively with Simcoe. Some posts I have dug up online has Bells telling folks they use Hallertauer Hersbrucker, Centennial, Glacier, Vanguard, and Crystal in the kettle. I admit, my preference in beers tend to run to the maltier side, but this is pretty damn good. Do I want to drink this all night? No. Did I enjoy sitting down and enjoying one after a long day at the office, I sure did. What really strikes me about this is how easy it is to drink. The body is not huge at all, thanks to the attenuation they get (about 90%) . Also, while it is bitter, it seems right. It is actually very well done, even for a non-hophead like me. I would never call a DIPA a balanced beer, that is not its point, but easy drinking….sort of, if 10% ABV is easy drinking! This would be a heck of a beer to try to clone. You have to nail the hops, but I think even harder is to get the malt bill right, probably a decent base of domestic 2 row, with some munich malt , and victory or aromatic malt, and a good slug of honey. Your mashing would be on the lower end for high fermentabilty, and controlling the fermentation to get 90% without getting tons of harsh alcohols if it gets too hot or having it under attenuate if it gets too cold would be quite the challenge. Probably not something I want 5 gallons of, but I know plenty of homebrewers who would enjoy having a few cases of this around.